Field Marshal Gerd von Rundstedt was primarily a professional soldier, not a savage Nazi. He even protested against the violent behavior of some German troops during the occupation of Poland. Most Junkers did not have the title of a baron or a count, but were recognized by the preposition “von “. Gerd von Rundstedt decided on a military career, like his ancestors. He graduated from the military academy and became an officer. Even before Hitler came to power in Germany, von Rundstedt had a high rank of a general. When the World War II started, Gerd von Rundstedt commanded the German troops during the attack on Poland. Interestingly, he was against the violent behavior towards the Jews in occupied Poland. Indeed, he complained about the violent behavior of some German troops to higher instances. Rundstedt was, in fact, primarily a professional soldier, not a savage Nazi. Rundstedt’s role in the German conquest of France was an important one. He commanded a wing that carried out a blitzkrieg attack on France through Belgium (the so-called Army Group A). After the victory over France in 1940, von Rundstedt was awarded the rank of field marshal. In the same year he was appointed on the position of “Commander in Chief in the West ” (German: Oberbefehlshaber West). 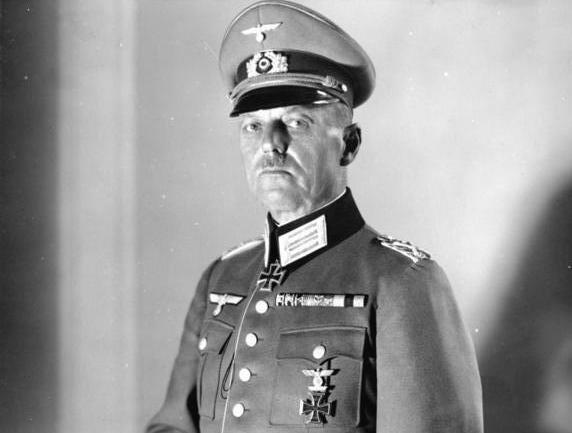 Thusly he was placed at the helm of the entire Western front during World War II and was directly subordinate to the main command center of all of Hitler’s military force – “Armed Forces Supreme Command” (German: Oberkommando der Wehrmacht). In practice, the aforementioned Oberkommando der Wehrmacht (OKW) substituted for the Reich War Ministry, which Hitler abolished in 1938. There was also Oberkommando des Heeres (Supreme High Command of the German Army), which was nominally subordinate to the OKW, but it actually quite independently controlled military operations on the Eastern front. After the end of World War II, Field Marshal von Rundstedt was arrested by the Americans. He was already 70 years of age and due to his old age, senility and ill-health he was never tried for war crimes (as assessed by the doctors). Finally, he was released and died in his native Germany in 1953. He was buried, in full uniform, in a cemetery near Hannover and the funeral was attended by about 2,000 people. 1916: How were the Jehovah’s Witnesses Founded?